Labels are a single word or a multiple word phrase you can add to the default language version of a specific article in Help Center. You can use labels to influence article search relevance, to influence Answer Bot results (if you are using Answer Bot), or to create a list of related articles based on labels. You can add and remove labels on individual articles or you can change labels on multiple articles at once. You must have Guide Professional or Enterprise to use article labels. Labels are a single word or a multiple word phrase you can add to the default language version of an article in Help Center. You can add articles labels for multiple purposes, including to influence search and Answer Bot results or to create article lists (see Understanding why to use labels). You can add and remove labels on individual articles or you can change labels in bulk for multiple articles at once. In Help Center or Guide, navigate to the article where you want to change labels, then click Edit article in the top menu bar. (Guide Enterprise only) If you are on Guide Enterprise, click Article settings. This step is not necessary on Guide Professional. In Labels in the right sidebar, start typing the label you want to add, then select Add as new label or select the matching label, if it exists. You might have to scroll down to see labels. See Best practices for adding labels. Labels live on the default language article and not on translations of the article. If you have translations, you can add labels in multiple languages to the default article. Add multiple labels as needed. If you need to remove a label, click the x beside the label name. You must manage labels on each individual article or using the API. There is no global management for article labels. 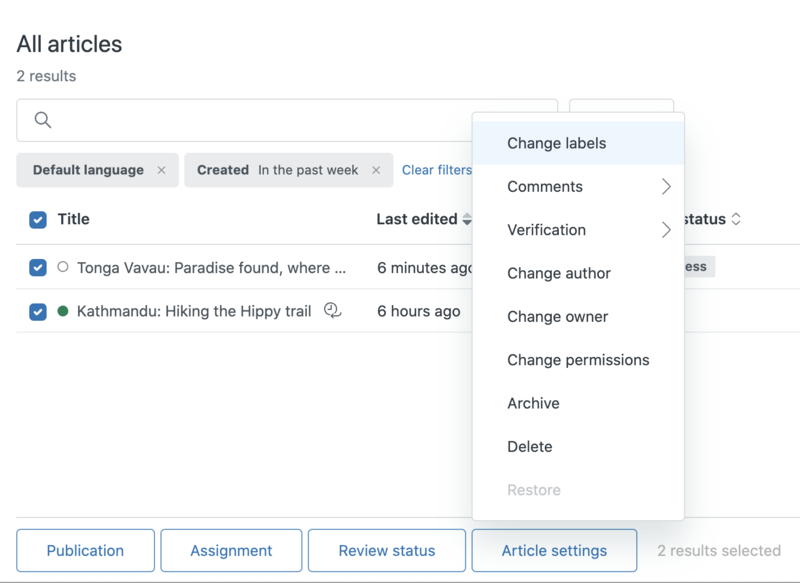 You can add or remove labels to on multiple articles at once. In Guide, click the Manage articles ( ) icon in the sidebar. Find the articles you want to update by browsing, searching, or using a new or existing articles list. Select one or more articles to change labels. You can select a maximum of 30 articles at a time. Click the Article settings menu at the bottom, then select Change labels. Add a new label: Enter the label, then click Add as a new label. Add an existing label: Search or browse to find the labels you want to add, then select any empty checkbox or any checkbox with a minus. The minus sign ( ) indicates that the label appears on some but not all of the selected articles. 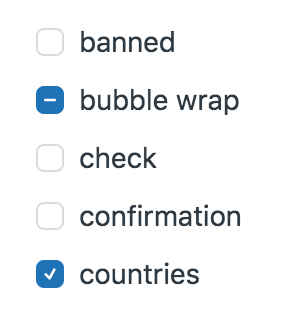 When you select it, it changes to a checkmark ( ), indicating that it will be added to any selected article that doesn't already have that label. You can select multiple labels to add to the selected articles. Remove an existing label: Search or browse to find the labels you want to remove, then deselect one or more labels. The checkmark ( ) indicates that the label appears on all of the selected articles. The minus sign ( ) indicates that the label appears on some but not all of the selected articles. 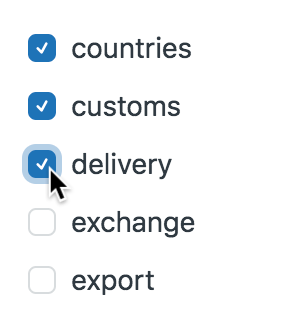 When you select a checkbox with a minus sign, it changes to a checkmark. ; click it again to deselect the checkbox. The label changes are applied to the selected articles. Adding labels can make your articles more search friendly. They are not designed to be used for fine-grained control of ranking. For example, if I have two articles about making waffles, one with the word "temperature" in the body of the article, one with the label "temperature", the labeled article will be ranked higher if a user searches for the word "temperature". Labels are indexed for search with a bit less weight than the article title, but multiple labels with similar words can outweigh the title and body of the article. Use labels carefully as you can significantly impact the relevance of your search results and usefulness. If you are considering using labels to impact search relevance, consider that efforts to do so could end up with inferior ranking performance for your users. The best way to have your article perform well in search is to create a short and focused article, where the title and body include keywords and clearly connect to each other. To learn more about search, see How end-user search works in Help Center. Answer Bot uses labels to influence the results it shows. It allows you to define a whitelist of articles that are allowed to be used when looking for relevant matching results. You are able to add up to ten labels that serve as an OR filter, allowing you to expand the whitelist to any articles containing any of the defined labels. To learn more about Answer Bot, see About Answer Bot. Article lists enable you to get an overview of all your published and unpublished knowledge base content, and then refine that view by using search and applying filters to build article lists. For example, you can find articles that have a specific article label, such as out-of-date. To learn more about article lists, see Creating article lists to different views of your knowledge base content. Labels can help boost the search relevance of an article. However, you should use labels carefully and sparingly. It's more important to make sure the article title and body contain the relevant keywords. It is possible to add labels as single words or as multiple words or phrases. In general, it's more efficient to use single word labels. If you add a multi-word label, the search engine breaks it into individual words to perform the search. For example, if you have a label of "late delivery," it gets broken down into "late" and "delivery" for search. Avoid using long phrases as labels to boost an article's ranking with respect to a query. For example, "Can I return something I ordered online to my local store." Instead, you should modify the article's title or content to make it literally relevant to the query. You do not need to include multiple labels for variations of a word. 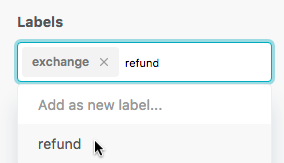 For example you do not need a label for "return" and "returns" or "update" and "updated." Search stemming allows different forms of the same word to match. In particular, the singular and plural forms of a word will generally match. Use labels sparingly. Adding lots of labels might actually diminish any matches on labels. This is because it is assumed that matches with a fewer number of labels beats matches with more labels. And too many labels might outweigh the relevance of the title and body. For example, if article 1 has the labels “car,” “automobile,” and “transport” and article 2 has only the label “car,” all other things equal, if the end-user searches for “car,” the article that has only the label “car” will rank higher. That is because, as a general principle, an article that is about one specific thing is more relevant than an article about many things, when a user is looking for that one specific thing. Note: The number of labels for search is limited to 200. The search engine will use the first 200 labels and ignore any additional labels. Your best bet is to look at the top ranked search queries and make sure that they exist in either (but not both) the title or the labels. You don't give content an extra boost if you match a term across the title, body, labels, and comments. Are there any specific restrictions with regards to tag length or content? Minimum lengths, certain characters not accepted? Occasionally run into an issue where certain abbreviations aren't accepted when you click "Add as new label". There aren't any specific restrictions; we did some testing internally with different characters and lengths down to a single character without problem. Can you provide us an example of what you're running into? I ran into this problem while testing something else related to labels earlier today. You have to make sure there's a space afterward. Try that and let me know if it solves the problem! Regarding limiting the number of labels, how many labels are too many? We recently imported articles, and the article keywords were imported as labels, but perhaps this should not have been done. No, sorry Tammy. I asked the team the same question, but they said they haven't found a magic number for when it becomes too many. I have an article where I put the label "add user" "adding user" "add" and when I search using these keywords in our help center, the articles I labeled don't even show up. A completely unrelated article actually gets listed in the result. What's up with that? Is anyone able to find out why I'm having this happen to my articles? Labels are definitely funky and not working the way I want them to. I see this is your first couple of posts, welcome to The Community! While labels can be effective in helping refine your search results, they are not intended to force behavior. The search function in Guide is ranked. The ranked search results are based on relevance scores, and are displayed to the user in descending order of their scores. You can learn more about that behavior in our article, How end-user search works in Help Center. It's likely that the other articles that are shown in the results include one of the keywords in the title of the article as article titles carry the most weight. I hope that helps clarify a bit! Thanks for sharing the knowledge, very useful article. I was wondering if there is some kind of average amount of labels for a successful search (I know there isn't a min. or max.). My guess is, the number of labels could be statistically related to the number of words on the article's title for a better search relevance. Hi Santiago! Welcome to the Community! I don't know of any data that indicates that there's an ideal number of labels for SEO. I would say that your best bet is to add however many labels as possible to ensure that potential search terms for your article are covered. I'd like to use the bulk update option to add labels to a large number of articles. From what I'm seeing, I can only select 30 articles at a time. Is that the maximum? Use Case: Adding labels to articles to designate them as 'Answer Bot recommended articles' (https://support.zendesk.com/hc/en-us/articles/115012444447). Yes, 30 articles at a time is the limit for a bulk article action. I'll add that to the documentation. Do labels support wild cards? I would like to fix this with an "*account*" wild card that will bring up a result as long as the word "account" is in the query. The same is true for other keywords. Labels do not support wild cards. In the example you provided, i'd recommend using a label for "account" rather than "my account" As a general rule, labels should be single words as they are looking for exact matches. If you want to include common misspellings then you might consider adding those as their own labels. I am assuming based on what I read above that Labels are not visible to end-users. Is that correct? You are correct and tags are not visible to end-users. Only agents on the account. Just one more question - based on what I read above, it seems that it is best to launch Guide before adding labels so that you can first see what terms users are most searching for. Would you agree with that assumption? I'm hesitant to add them before launching for fear of ending up "with inferior ranking performance" as mentioned above. I would say that's a safe assumption, however it doesn't hurt to include labels in the appropriate articles if you're confident those search terms would be used. For example, if you have a Password Reset article then it wouldn't hurt to include password as a label as it's certainly relevant to your article.